When I meet the unshaven man in plaid zippered jacket and vintage 70s shirt he looks more like a bass player than the crisp profile image of Big Issue columnist, Mic Looby. “I shaved especially for that,” Looby quips. His eyes are ringed with tiredness characteristic of too much computer time or caring for a young child. And this Mic Looby does both. The Looby I’m here to interview is the author of Paradise Updated. His first novel follows newbie guidebook writer Mithra as she heads to Maganda in search of the legendary Robert Rhind who wrote the first version of the guide revered by travellers as ‘the Bible’. Complications arrive when Mithra realises she has to sack Rhind while researching Maganda. 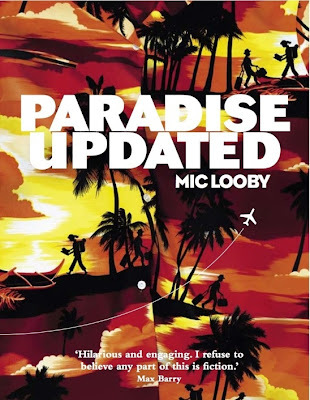 The story flips between exotic locales and corporate machinations as Looby satirises the “bogus authority of the guidebook which is at the heart of a lot of what I wrote”. He swapped identities again to become a guidebook author, his typo-friendly nickname in several guides. That name comes from a family joke about naming him Heironymus, later to be ‘Aussiefied’ as Heronymic then abbreviated to Mic. Many's the time I've sat on the train and paged through my newly purchased copy of The Big Issue to start reading at Mic Looby's page. The remark about visiting Burma reminds me of the time I went on a trip to South Africa (1980, I think). I'm embarrassed to say I was so politically naive that the concept of supporting an evil system of government didn't even enter my head - I just wanted to see elephants and zebras. My eyes were soon opened. Apartheid was quite overwhelming to a naive young Aussie. If I hadn't seen the terrible situation I would have missed a vital part of my education. Sounds great! Am really looking forward to reading this one.